Highly precise portioning scale. 8 Kg. capacity. Precision commercial scale, ideal for restoration or any trade that requires precise weighing of small portions. The LEQ Series Portion Control scale from SAMMIC will give you the precision you need to help maximise your profits while requiring minimal space. The LEQ Series Portion Control scale from SAMMIC provides an economical alternative to address your portion weighing needs in a wide range of manufacturing and food service applications. Ideal for restaurants, bars, pizzerias, bakeries, industrial kitchens, hospitals and more. 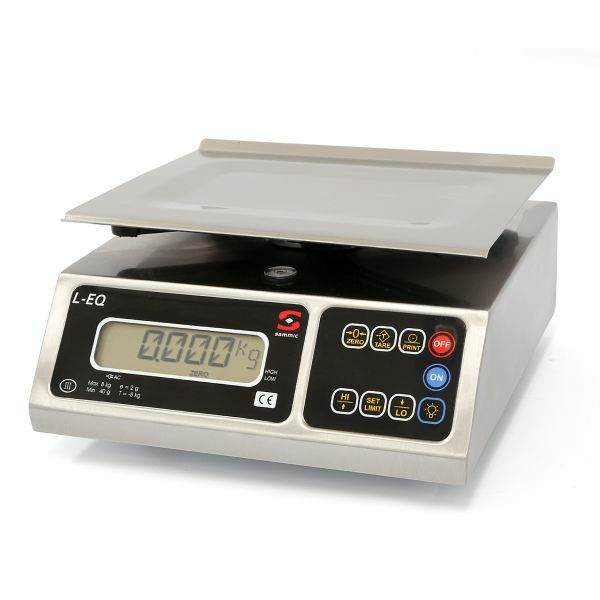 The LEQ Series scales feature a progressive tare to obtain net weight while automatically subtracting the container’s weigh for precise measurement. Built to last: Stainless steel cabinet and removable plate. An included rechargeable battery lasts over 100 hours. Auto power-off function to save power. Includes PC or printer interface through serial port RS-232. A programmable audible alarm for maximum and minimum weight allows fast operation.